Have a question for us? Before asking, do check carefully on this page as it is very likely the answer is here: These questions have been compiled after being asked the same questions by our guests on a regular basis in the last 9 years; that is why we have included them. They are categorised to help you quickly find the answer you are looking for. Have we really missed something? Contact Clare and she will get back to you; more often than not, the answer is already here on this page. Is the Dominican Republic a safe country to visit? The Dominican Republic is a safe country to visit and Cabarete, where Swell is located, is a cool town with friendly locals and expat surfers & kitesurfers from all over the world who have made Cabarete their home. Like all central-American countries, there can be petty theft, so don’t leave your Iphone on the beach in plain sight when you go for a 2 hour surf or kite session. I am travelling solo, will I be OK? 70% of our guests arrive at Swell as solo travelers and leave us having made a lot of new friends. In truth, staying at Swell means you are never really alone: Friends are quickly made and our guests are quite amazing in the way they settle in and make Swell their home-from-home in a matter of hours. We constantly find that our guests take new people under their wing even before our staff have had the chance! Have a look at the gallery of the good times to get an idea of the vibe among the solo travellers. Which day of the week do I need to arrive at Swell? You can arrive any day of the week with us; we don’t tie you down to Saturday or Sunday arrival. Just contact us to see if we have space for you for your chosen dates. What is the average age of guests at Swell? We are proud to have a really broad age-spectrum: We’ve taught people ranging from 18 to 65 year olds to surf. In general, our average age is around 34 years old. If you are worried that you might be too old to learn to surf, don’t! Age doesn’t matter: All you need is the spirit and passion to give it a go. You’ll find that what binds Swell guests together is not being the same age, but loving the feeling of catching waves, being by the ocean, bare-feet in the sand and living in board shorts. Can you tell me more about the room types and which is right for me? Remember that you are not paying only for the room, as your 7 night package includes airport transfers, 4 dinners, daily breakfast, surf beach transport and surf lessons/board rental. Swell's shared rooms are a budget option; take this room if you don't mind someone in 'your' space, don't mind sharing the room and bathroom/WC with guys or girls and don't need A/C. If any of the above makes you nervous; take a private room. All our rooms have shampoo, shower gel and conditioner in dispensers. We do not have hair dryers in any rooms. Yes, each private room and dorm bed has its own safe. Safes are not big enough for most laptops. Swell has a strictly guest-only policy for admittance to our premises, therefore, belongings are generally secure inside the camp. What power sockets do you have; do I need an adaptor? Our power sockets are the same as the USA and Canada, so you will not need an adaptor if you are coming from either of those countries. If you are travelling from Europe, bring the same adaptors as if you were travelling to the USA. Are there medical facilities in the DR and do I need immunisations/malaria pills? Yes, there are good doctors who speak English in and around Cabarete. The CMC hospital in Sosua is a 10 minute drive away and they have English speaking doctors and surgeons with good qualifications. Make sure you travel with a good travel insurance policy to cover you for any medical emergencies. No special shots are needed for a visit to the DR. Malaria is not a problem here. We do have mosquitos though and so to prevent mosquito bites, bring a good repellent, or buy some in the supermarket a short walk away from Swell. Close to Swell is a laundry where you can take your dirty clothes and they will charge you to wash, iron and fold your clothes, by the 1lb. Haudy, the Swell surf camp manager, will tell you exactly where it is. What is the nightlife like in Cabarete? Cabarete is a very cool vibrant town, with a good variety of bars, all within a short walk from Swell. From lounge-type beach bars with live music, or no music, to thumping beach clubs with loud Reggaeton music, you can find what you are looking for to party into the early hours. Luckily, Swell is not affected as a rule from party noise! I don’t want to surf, can I still stay at Swell? I don’t want to stay at Swell, can I still surf with you? What is the weather like in the DR & what kind of clothes should I bring? Well, it’s almost always hot here, so no warm clothes are required, save for a hoodie in case of a cooler morning in Winter months (Dec through March). The water is always very warm too, so no wet suits are needed, not even a shortie! Well, in short, unlike Costa Rica where it can rain solidly for 3 months, we don’t have a rainy season: It can rain at any stage (often during the night) and is normally a sharp downpour before the sun comes out again, strongly. Rain is less likely between June and August than at any other time of the year. The weather forecast shows rain, should I be worried? The Dominican Republic is a stunning, mountainous island and undoubtedly, it is always raining somewhere in the hills: Just imagine, it takes 7 hours to drive West to East. This is not a small island and with Pico Duarte (the highest peak in the Caribbean) right in the middle, don’t expect forecasts to show nothing but clear skies. Extended periods of rain are rare, but most likely in May, December and January. Which currency is used in the DR and where can I change money? The local currency is the Peso (currency code DOP). The airport has a currency exchange, but don’t change money there as their rates are very uncompetitive. Very close to Swell on foot are two good currency exchanges, and two banks which will give a much better rate. You can only take out Dominican pesos from the local ATM machines. US dollars and Dominican Pesos are both accepted methods of payments in Cabarete; The general rule in a shop or restaurant is pay in the currency the item, drink or food is priced as restaurants and shops will not necessarily always give you a good exchange rate. Dominican ATM machines only give out pesos – they often run out of cash at weekends – so prepare yourselves! It’s best to have a mixture of USD and Dominican Pesos. Can I use credit cards in the Dominican Republic? Generally, don’t expect anyone to accept credit cards as payment: cash is king and credit cards will always incur some extra taxes (as much as 28%) on goods and services. At Swell your arrival balance must be paid in cash in either USD, CAD or Dominican pesos, the same goes for your departure balance. How much spending money will I need while I am at Swell? It is difficult for us to give you an exact figure as everyone has different spending patterns, but here is an idea of various items you might spend your money on: A local beer costs between $3 and $4 USD. A local lunch will cost you around $5 or $6 USD and for a dinner outside of Swell, expect to pay $10 to $15 USD. Our average drinks bill at Swell is around $35 USD after a week-long stay. Check the Day Trips page of the website for the cost of other activities you might want to do whilst you are with us. What is the ratio of student to surf coach at Swell and do you do offer photo or video analysis? Swell has 2 or 3 full time surf coaches, depending on the season. Our place holds a maximum of 20 guests, but as we often have solo travellers in the private rooms, we are only at capacity during the most popular Holidays. Most weeks we have on average 12 guests staying, and not all are taking surf lessons. This means that during a typical learn to surf week, there will be around 8 to 10 guests in surf lessons with our surf coaches. Swell does not offer one-on-one coaching, photography or video analysis. There are often photographers down on the beach who will sell you some photos of you surfing. Do you offer guided surf trips to other spots? No, we don’t: There are other breaks in the DR, some of them are world-class on their day. However, we know from years of experience living and surfing here that you must be a very competent surfer already to safely surf those spots, as they are often a long paddle out against strong currents. Unlike Encuentro, those other surfing spots also require a certain swell height and direction to make them worth a visit. We can certainly offer advice and help to expert surfers on where to go and when, if you are staying with us. What do I need to bring for my surf course and how can I prepare? Here is a little list of essentials: *1 Sunscreen (at least SPF30 and waterproof) *2 A pair of board shorts; longer is better as you will protect your legs from a rash. *3 A rash-guard for when your surf course is over (during your course you must wear one of our Swell rash guards). 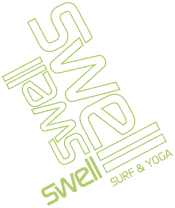 *4 (Optional) Surf booties: Swell will provide you with reef booties but do bring your own if you prefer to wear shoes noone else’s feet have been inside! We also provide beach towels. Before you arrive at Swell, Clare will send you an email with links to follow to prepare for your surf course, including some great exercises you can do to improve upper body strength; essential for paddling and popping up. The best (closest) airport to fly into is Puerto Plata (airport code POP) and transfers to and from are included within your package. POP is only 25 minutes away from us and has direct daily flights from New York (JetBlue and Continental airlines) or Miami (American Airlines) and flights from Europe too. Take a look at our LOCATION page for more flight/airport ideas and the costs of airport transfers. STI and SDQ are both options, but additional taxi fares will apply. Punta Cana (PUJ) is only an option if you don't mind renting a car and the 5 hour drive to Swell. I'm worried about arriving alone at the airport, how do I get to your camp? Rest assured, our taxi pickups are safe and very reliable: Clare goes to great lengths to make sure we have your flight arrival information for your collection once you have booked your stay. Is the flight included in the package price? We can't possibly include flights in our packages; our guests travel to Swell from all over the world, so it would be impossible to do so. Take a look at our location page to see all the airlines flying to the Dominican Republic. Can you handle vegetarian/vegan/gluten free food? Whilst we do not have a team of chefs to cater to every whim, we are well used to catering for vegetarians, vegans and people with other food intolerances. We have a wide variety of ingredients to choose from and will always try our very best to cater for your needs if you tell us in advance, so just send us an email to see what your options are. Can I drink the tap water and do you have a bar at Swell ? You don’t need to drink the tap water as Swell provides safe drinking water for free from a water cooler in our kitchen area:) We have a lovely honesty-system of self-service drinks at Swell: Guests help themselves to fairly-priced beers, sodas, wine, etc. from our drinks fridge and then they write those drinks on their own tab, paying at the end of your stay. You are welcome to bring in your own spirits and use the ice from our fridge to mix some killer-drinks! We have a plastic-free policy at the camp, so we limit our drinks for sale to those which can be re-cycled. Can I cook my own food at Swell? No you cannot use the Swell kitchen at any time for preparation of food, nor use our fridge to store your food. If you wish to self -cater, Swell surf camp is not the right place for you. But, if you want to be looked after with truly delicious food (there’s a good reason why our guests have asked for a Swell surf camp recipe book to be published), and be within a few meters of a whole bunch of other restaurants, then do choose us for your surf vacation. How do I make a reservation at Swell? Use our Contact Us page to send Clare an email with your preferred dates. We answer emails quickly and your email is guaranteed to reach us if you correctly enter your email address (sadly lots arrive with errors in the email address, so we can't respond). Once you are settled on your dates and tell us you are ready to book, Clare will hold the room or shared bed for you for a few hours to allow you to make the payment for your stay. Depending on how far in advance you are coming, it will be an 80% deposit, or full payment. We have a very strict cancellation policy: Refunds are not possible but we will give you an invoice so that you can make a claim on your travel insurance for reimbursement. A good travel insurance policy is essential; it is not wise to travel to a foreign country without one and it will come in handy if you have to cancel, cut short or extend your stay. It's also daft to travel on an active vacation without an insurance policy in place to protect you in case you were to get ill or be injured. How far in advance do I need to book for a surf holiday at Swell? We can book up weeks and even months in advance: We recommend that you book at least 4 months in advance of your intended stay. Popular holidays can fill up even further in advance so if you know you want Swell to be your surf vacation choice go ahead and book early to avoid disappointment! Prices can often be cheaper the longer ahead you book. Can I combine surfing and kitesurfing on my trip? Sure, plenty of people do. Surfing is mostly done in the mornings at Playa Encuentro, A short ride from where Swell is located in Cabarete. The kitesurf lessons don’t start until around 1pm when the trade winds start to kick in. So if you are interested in learning both surfing and kiteboarding, you can send Clare a message and she can give you a price quote to learn both of these exciting sports on your water sports adventure holiday. What’s the cost of kitesurfing? Lessons start at $72 USD per hour per person and include one-on-one instruction with an IKO instructor and equipment during the lesson. You can always take an hour or two to try it before you commit to more hours. Where is the kite school in relation to Swell? Our partner kite school is less than 5 minutes level walk from Swell. I want to do other stuff than surfing whilst I am in Cabarete, how can I organise those things? We organise a variety of adventures for our own guests each week: Haudy, the manageress of the camp can organise canyoning, snorkelling, horse riding, kitesurfing, Yoga, massages, special dinners out and pretty much anything you have in mind. All excursions are best booked once you are in Cabarete and often all our guests go together to take part in these trips. Molly, our Yogi, is an Ashtanga practitioner. Our Yoga is relaxed and unpretentious: Molly's teaching style is warm and supportive and she encourages students to explore beyond their perceived limitations by emphasising proper alignment to maximise performance and prevent injuries. You do not have to be a regular practitioner of Yoga to take and enjoy a class at Swell. When is the Yoga at Swell and can I add more classes? Monday, Wednesday and Friday afternoons at around 5pm. We don't have time for more Yoga at Swell as our guests are so often out and about doing all the other fun excursions on offer.